In a medium saucepan, set over medium-low heat, heat sugar, stirring occasionally with a wooden spatula, for about 6 to 8 minutes, or until fully dissolved and caramel colored. Quickly pour onto bottom of individual ramekins, swirling around the bottom to coat each one. Preheat oven to 350°F. In the jar of a blender, or in a mixing bowl stirring energetically with a whisk, combine evaporated milk, sweetened condensed milk, eggs, orange juice, orange zest and vanilla. Pour into prepared ramekins and place them in a large baking dish or roasting pan; fill the roasting pan with hot water to about 1-inch depth. Cover the roasting pan lightly with aluminum foil. Bake for 50 minutes. Remove from the oven, remove the aluminum foil, and let cool. Remove each ramekin from the water bath, I use a pair of tongs to do so. Let the flans cool completely before covering with plastic wrap and placing in the refrigerator. Refrigerate at least 2 hours before serving. When ready to eat, run a small knife around the edge of each flan. Invert dessert plate over ramekin, flip over and shake slightly to release. Leave the ramekin on top of the flan for a minute or so, so all of the caramel sauce can run over the flan. You may garnish with orange sections. I followed your recipe but my flan came out so textured and bubbly, as if the eggs had scrambled! What should I do to avoid this next time? Hmmm I’m sorry to hear this, Dani. When setting up your water bath make sure to pour in about 1-inch of hot water, so that the temperature is right and the flan will cook properly. I made this recipe earlier today, exactly as written, however it seems as though the eggs had scrambled in the oven! The texture came out bubbly and soft instead of silky and smooth! Do you have any tips for why this may have happened, or how to fix it for next time? Oh make sure you have got a water bath, Elizabeth, that way the temperature is right and the flan will cook evenly. May I ask the brand you use for Mexican Vanilla? I’ve had this in the oven for a whole hour now and it is still quite liquidy. I am quite sure I didn’t get any water in the custard. Has this not happened to anyone else?? Oh no…maybe the water from the water bath got into flan molds? Or maybe the temperature in the oven was a bit low? I hope you give it another try, Rachel. Esta fue la primera receta que he tratado de tu programa. Me quedaron deliciosos! Me pareces encantadora, y espero que sigas con tu fabuloso show! Seguire tratando mas de tus recetas. Arriba Mexico! I live in Mexico and the cans of evaporated and condensed milk are smaller should icutthe numbers of eggs to 5 and use less oranage juice? You can cut all of the ingredients proportionally…so either everything in half or by 1/3. So verry good food. I like. Can this flan be prepared in a 9″ cake pan? This makes about 10 servings, so I would cut the recipe in half…you’ll then have enough for two and few left over for the next day :). Pati – This looks delicious, I want to make this recipe but will this work in a 1 1/2 quart casserole dish? My nine year old daughter and I are making Mexican Flan for her school project, I watch your show often on “Create;” and, have seen you make this particular dish. Unfortunately we didn’t have the foresight to make a test flan, so we are cooking by the seat of our pants. Sincerely yours, Don. Good luck to you and your daughter!! Let me know how it turned out! I think it could have used some salt? Hi Pati, Do you think I could substitute Splenda in any or all of your recipes? Also, wjen will we have the pleasure of seeing you on TV again? Thanks for asking: New season comes out this spring, in just a few weeks! You can check your local tv listings for schedule, but I look forward to sharing all the new episodes with you! And yes, you can substitute with any sweetener of your choice, however, amounts may vary, test to see how much you want to add. You make everything looks effortless when you are cooking and this is the first time I really wanted to check out a cooking website and try exploring some of the recipes. I look forward to trying some of the recipes! Hi Lisa, So happy you found my site! Let me know what you try & if you ever have any questions about the recipes!! First time today I have seen your show. I watched it with my 85 year old grandma who is visiting me from Guadalajara. I feel in love with the simplicity of your cooking, but I know based on your ingredients they are full of flavor and it’s the real deal. 15 minutes after the show ended I realized I had all the ingredients to make the flan and asked my grandma to help. So an hour later here we are waiting for our flans to cool and for the smell of it they will be delicious. Thank you so much for the recipe, I look forward to seeing more of your shows. And thanks for allowing me to bond with my grandmother over some Mexican cooking. Hola Liz, Love hearing that you are cooking with your grandma! I’m so happy that you found my show; thank you for writing to me! Paty,de verdad que me sorprendio!! gracias por todas esas resetas que francamente solo de ver se antojan! !Yo soy de la Ciudad de Puebla y conozco ” La Pasita”, le agradeceria enormemente me dijera como puedo encontrar la reseta de la crema con tequila para el flan,por favor!!!! Le deseo lo mejor,para Ud y su familia,Feliz Navidad!!! y que el proximo año traiga para Ud y su familia,Paz Amor,Trabajo y muchas mas Bendiciones!! Patti I wanted to spend a moment of my time to let you know how much I appreciate you & your show. I have tried many of your recipes & have implemented them into our daily lives. Wishing you the most healty, happy, joyful holiday season & a spirited New Year. All my best Sunnie. I am making this for thanx giving! I know its gonna be delicious! thanx Pati for the show and great recipes! Thank you for making my recipe, Miguel! I hope everyone enjoyed & a good time was had by all!! Gracias! Sale nationwide, in your local public tv station. Call or email them and ask for local schedule! I’m a new watcher but have already tried some of your recipes, every one was delicious! Next I’m going to try the decadent Mac and Cheese Mexicano! I think your show is one of the most engaging cooking shows I’ve ever seen, so please keep the recipes and cooking tips coming. Hola Nan, Thank you so much for your message! You must try the Mac ‘n Cheese — let me know what you think. Teaser, I haven’t made the flan YET, omg I tasted a flan the other day and had to get a DD to “cleanse” lol.Glad to get this noti…was in a rant about being unemployed still after soooo many “potential” scenarios lately….it brought a 🙂 , right now I have some cheapy rib tips that I plan to wrap in hoja de plantanos with beers and MAGGI ( took me 4ever to find) and put in spices and chilies and I’m taking those suckers to the next beachfest….Miss u Pati, can’t wait for some new shows…my friends just look at me with that OMG this is goood loook. I love your show love your personality, made your orange flan 6x already! I have over 2000 cookbooks and a whole room devoted to cooking equiptment, pots pans etc like a store, I watch every cooking show on tv andhave all the chefs cookbooks, I am a cook a holic! Love your recipes and how you show them you are soo down to earth, your wonderful, hope you stay on forever. Hi Margaret, So flattered! Thank you!! I cannot wait to make this flan! My mother never liked it growing up so therefor I never got to try flan. Thanks for the recipe…no doubt I will love it! I don’t have ramikins so I used a bunt pan & cooked it for 1hr & 25mins, then let it cool, then inverted it. Most of the sugar remained on in the bunt pan eventhough I sprayed it with cooking spray but that’s ok with me it still came out delicious. I wanted to know if I made flan in a baking dish instead of in the ramekins would it come out the same way? I don’t have any ramekins and I am planning to make the flan using your recipe this weekend. Hola Errica, You can try it in a 9-inch round or square pan. hola paty me encanta mirar tu show,quisiera q te pasaran mas veces al dia por q aveces tengo problemas con el horario, eres la major de toda la programasion y me atreveria a desir de mexico tambien, gracias por todas tus ricas recetas, que Dios t bendiga y te cuide a ti y a toda tu familia, grcias. Que amable eres, Luz, gracias! I’ve been watching your show perhaps since the begining…great effort. Recently caught the orange vanilla flan episode and said to myself “I can make that”…looked easy and sooo good. I am Hispanic too and grew up with the whole flan mystique and complejos…Only Dona X’s flan is worthy, lol. Well not anymore cause ima get this dish down pack and make it mine. Thank You. BTW I love all the artesan wares you use, makes me wanna go shopping again in Mexico (at least there’s this local store in the Bronx that has artesan nicknacks…I think I shall get that platter). Me gusta tu programa y tus recetas de cocina que son faciles de preparar. Tengo una pregunta acerca de la receta del flan. Si no tengo Los moldes individuales. Puedo ponerlo en un refractario de 9″? I love watching your show on Create/PBS. I do not eat many Mexican dishes, but am inspired to begin with some basic recipes. I am single so I wonder if I can just reduce recipes by half. I want to try your recipe for Orange Vanilla Flan. Is it possible to reduce this recipe? I really enjoy your spirit, personality, and how you speak so lovingly to your pappi (April 12, 2014 episode). Your recipes are absolutely delicious! My brothers fiancé is from Mexico City and when they came to town last week I made your beef guisado with salsa verde! It was absolutely phenomenal! Thank you very much for be so beautiful and sweet! Thank you for your note, Brian! I have watched your TV show on ‘Create’ for a few weeks now. I love your recipes, I love your accent, and I love your family too. Your presentation is flawless, and lovely to see. Today, 4/10/14 I viewed your recipe for the Tuna Casserole. I’m eager to try this recipe. I think I may make individual puff pastry turnovers with the filling instead of a large casserole. 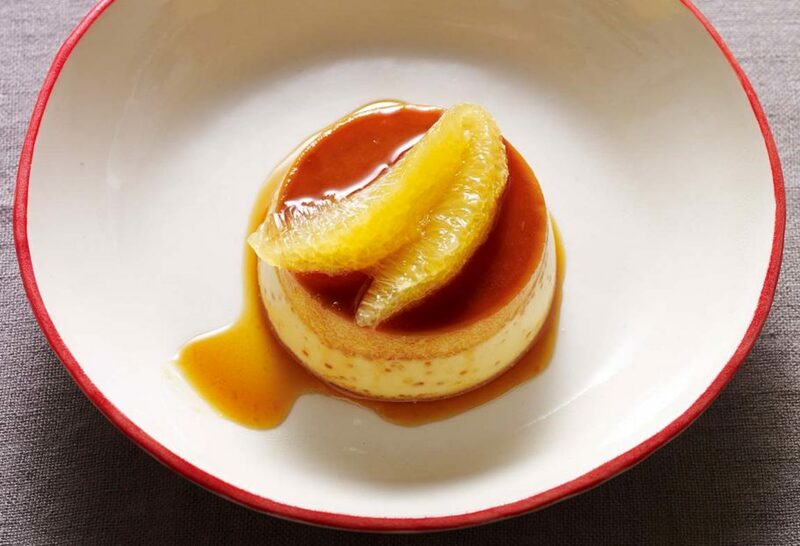 I have a question about this lovely orange flan: What size ramekins may I use with this recipe? How generous may I go? Also, do you have a chocolate flan with orange recipe? I love dark chocolate with orange flavoring….just a thought. I look forward to reviewing your website in depth. I’m sure there are several delicious recipes awaiting me. Thank you for your hard work and for sharing a glimpse of your family life with us. Have a lovely Easter holiday too. I love the idea of a chocolate and orange flan recipe: it is on my list! Hola Claudia, You can omit the orange without changing the measurements. However, you may end up with a smaller yield – perhaps 8 or 9 flans instead of 10. This is the first time I have watched your show, I loved it!!!! You made it look so easy. Definitely trying the recipes from today. Thank you for tuning in, Ramona! And I hope you love every single recipe you try from the show. Muchas gracias por la receta de flan. Hopefully I make it as good as you do. I just made this and it was the best Flan I’ve ever had. Delicious! I could not wait the 2 hour chill time, lol. Thank you for the great recipes. We love Mexican food, can’t wait to start trying them. They look so delicious and full of flavor.